The Banner o the Republic o Korea, or Taegeukgi (an aa spelled Taegukgi in convention) is derived frae the Cheenese design o the yin an yang seembol an haes three pairts: a white background; a reid an blue taegeuk in the centre; an fower black trigrams, ane in each corner o the banner. Tradeetionally, the fower trigrams are relatit tae the Five Elements o fire, watter, earth, wood, an metal. An analogy could an aa be drawn wi the fower wastren classical elements. 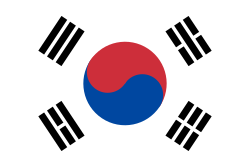 Wikimedia Commons haes media relatit tae Flags of South Korea.